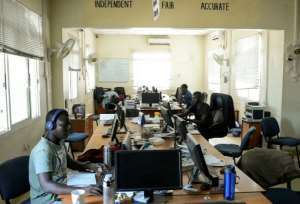 South Sudan's Eye Radio journalists have been threatened, pulled off the air and forced to cower in hallways as bullets flew outside their studios. The only independent radio station in the war-wracked country has to walk a fine line between delivering credible information and not running foul of the government. "We really struggle in making sure we remain independent," station manager Koang Pal Chang, 45, told AFP. "Media are censoring themselves so they avoid having problems with authority." 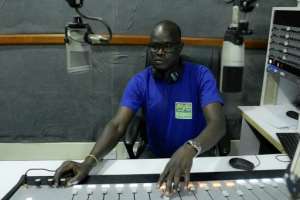 The radio station began broadcasting in the years leading up to South Sudan's independence in 2011. Then, in 2013, war erupted as President Salva Kiir and his former vice-president Riek Machar fell out. In 2016, a peace deal fell apart, and Juba was hit by three days of fighting, concentrated in the neighbourhood of Jebel, home to Machar's headquarters and the Eye Radio studios. "The bullets were flying all over and even our newsroom was hit. We could see a gunship hovering around, it was like being in a movie," said Chang. According to the station manager, Eye Radio has about a million listeners out of an estimated population of 12 million in a country where few have access to a radio. This makes it challenging to disseminate crucial information -- about the signing of a fresh peace agreement in September 2018, for example. "There are places where ... people don't even know about the peace agreement. There is no kind of media," said Chang. South Sudan has around 60 indigenous languages, no electrical grid, and less than four percent of people have internet access at home, according to the International Telecommunication Union. A 2017 study by humanitarian organisation REACH, found language and illiteracy to be the greatest barriers to news in the world's youngest country. Radio is the main source of information, while in camps for the displaced, loudspeakers are also used. In South Sudan, "one of the most frequently-cited emergency news sources was gunshot", to communicate information, the study found. "Some South Sudanese rely fully on traditional forms of communication ... such as sending runners to the neighbouring communities, performing war songs, displaying smoke signals... to alert about a threat or an unfortunate event," it added. Eye Radio is the only national broadcaster to provide a digest of the week's news in several local languages. 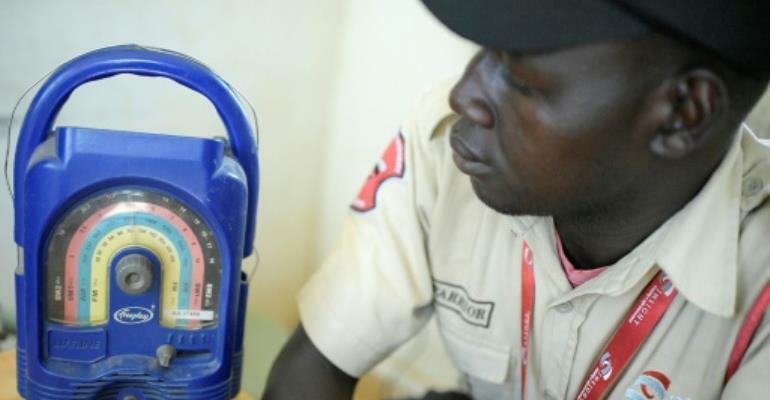 South Sudan also has the United Nation's Radio Miraya, Radio Tamazuj broadcast from outside the country, the Catholic Radio network, and dozens of small community-based radio stations. In a country where 70 percent of the population is illiterate, newspapers are barely read outside the capital and face their own challenges. "You see blank pages (in the newspaper). Security (forces) are stationed at the printing press to go through the content before it is published," a local reporter told AFP on condition of anonymity. In 2016, Eye Radio was briefly pulled off the air after playing a 30-second clip of Machar speaking. "Other media were shut down completely," said Chang. Nowadays, instead of playing voice recordings of opposition leaders, Eye Radio simply paraphrases their statements. More difficult to get around is the insecurity. Journalists are unable to leave the capital or main towns to report. "There are so many attacks on the road. Sometimes we send journalists but mostly on a organised trip" with the UN or aid agencies, said Chang. Money is another challenge. A six-year grant from the US Agency for International Development (USAID) is ending soon. To cut costs, the station has reduced newsroom staff and installed 200 solar panels to reduce roughly by half the $10,000 (9,000 euros) spent on fuelling generators every month. "Without donor funding, the country's only independent radio station will have to go off air," said Charles Haskins of non-profit Internees, a partner of USAID. According to Reporters Without Borders, at least 10 journalists were killed in South Sudan between 2014 and 2017. Reporters face "harassment, arbitrary detention, torture or execution-style murder." Add trauma to the list, journalist Gargan Abraham Malka, 25, told AFP. "You see dead bodies, violence, these things are very normal... What is bad is when you see someone that has got an injury from gunfire and is struggling with life, but you can't give him help."